As agency people, you’d know that Island East is dead on Sundays except for the few brunch-goers at The Newsroom. Since last September, however, the desert transforms into a vibrant outdoors organic market that entices with the smell of freshly baked rolls, independent musicians striking a few cords on stage, face-painted children playing on man-made grass and more than 50 white-canopied stalls selling home-grown vegetables, yoghurts, baked goods as well as handmade crafts and clothing. Though the Swire-sponsored Island East Markets has grown from a stage when founder Janice Leung Hayes and her team would beg for vendors’ participation to now receiving more than 200-plus applications at every open season and, on 14 December, setting up a pop-up market in Wan Chai, Leung Hayes said her main marketing channels have only been “social media and word of mouth”. “I think our success has a lot to do with timing and the execution. Hong Kongers like to go to shopping malls, where there are a lot of activities aside from buying things. So we took a similar approach: when people come to our market, they can also sign up for cooking demos, workshops or listen to music,” she said. Prior to Island East Markets, Hong Kong only sported a few farmers market – most were in New Territories and one was at the Star Ferry Pier – which is perhaps why only mere social media and word-of-mouth were sufficient to get people excited about something they’ve been yearning for such a long time. Aside from Facebook, Instagram and Twitter pages as well as an official website, Island East Markets gets help from Swire Properties – which owns the strip Island East Markets is on – to spread the word with posters at the lobbies of Tai Koo Shing Residences and inside One Island East. 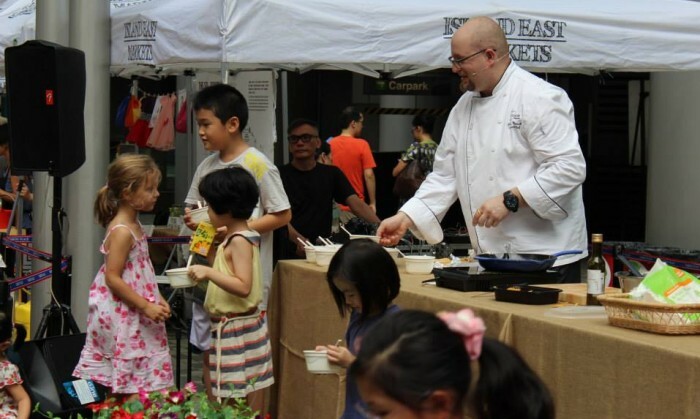 Since its inception, however, others like The Pawn – which just hosted its own famers market over the weekend on its rooftop – and The Green Queen, which usually sets up a paid-admission camp in The Space in Sheung Wan – sprouted. Yet, Leung Hayes said Island East Markets works to spread the message rather than being a “real business”: currently, vendors’ rents are still the biggest revenue for her.